It is my distinct honor and privilege to serve the Electrons Devices Society as your 2018-2019 President. I would like to express our sincere gratitude to the Past President Samar Saha for his stewardship and numerous accomplishments during his tenure. The efforts of many dedicated volunteers have positioned EDS on solid ground in the technical and financial areas. As a volunteer-led, volunteer-driven organization, we rely on the dedication of individuals like you to share their time, talent, and energy to help make EDS the premier global society devoted to advancing the field of electron devices for the benefit of humanity. As a member of our Society, we invite you to play a vital role in this effort. Member Recognition. Our members do important work, impacting nearly every facet of life around the world. Recognizing the accomplishments of EDS members is a vital part of why we choose to be a part of the society. Being a financially health society, we give out more than $35,000.00 in awards every year. EDS Mission Fund. 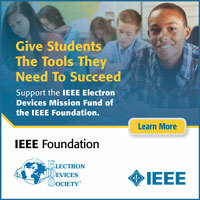 Thanks to generous donors, EDS is able to expand our assistance to students studying the field of electron devices and our worldwide K-12 educational outreach program, EDS-ETC, which inspires young students to explore a field in engineering. More information on EDS Student Fellowships and EDS-ETC can be found on our website. Donate to the EDS Mission Fund Today! Committee Appointments. EDS has a host of standing and technical committees that are important venues for members to become more engaged in the working of the society. These committees are a wonderful opportunity for EDS members to meet colleagues with similar interests and build the types of personal and professional networks that are the lifeblood of our individual careers and the industry as a whole. Chapter Activities. Thanks to the efforts of our volunteer leaders and efficient and enthusiastic staff, EDS now has more than 200 chapters around the world. Keeping this family close-knit and vibrant provides significant opportunities for networking on a local level. To help connect to the EDS members nearest to you, you can find your local EDS chapter on our global chapters map. We strongly encourage you to join a local EDS chapter. Technical Meetings. The benefits you can derive from membership in the Society can be greatly enhanced by attending the many conferences, workshops and symposia supported by the EDS. By becoming a member, you will be able to attend these conferences at the lower member rate. We hope you will be able to take advantage of these meetings as a means of staying current with our fast moving technology. Education and Training. An important part of our member benefit package is education and training. This year we plan to invest approximately $100,000 to support our Distinguished Lecturer and Mini-colloquia programs as a reach out to our members worldwide. Publications. As an EDS member, you have free on-line access through IEEE Xplore® to four publications, which include our Society's new offering, the IEEE Journal on Photovoltaics, as well as Transactions on Electron Devices (1954 to current), Electron Device Letters (1980 to current), and the Journal of Lightwave Technology. Free online access will also be available through IEEE Xplore® to the entire collection of the IEEE International Electron Devices Meeting (IEDM) technical digests from 1955 to current. Consider publishing in our open access journal, the IEEE Journal of the Electron Devices Society, This new journal provides authors an affordable outlet for rapid publishing and universal access. Webinars. Members-only content such as webinars and tutorials with engineering luminaries like Chenming Hu, leader of the UC Berkeley team that created the FinFET 3D Transistor, and Table of Content email alerts delivered right to your inbox. Think global, act global. 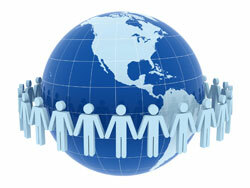 For EDS to be a truly global society we must be prepared to meet wherever our members are. With more than 10,000 members and over 200 chapters on six continents, that can be just about anywhere. The vitality and future of the Electron Devices Society depends upon the talent and active participation of all its members. Again, we welcome you to the Electron Devices Society. If you have any questions or concerns, please do not hesitate to contact either one of us or our Executive Office.